The executives at the helm of Hollywood’s biggest studios are accused of conspiring together in an effort to suppress worker salaries, according to the Los Angeles Business Journal. 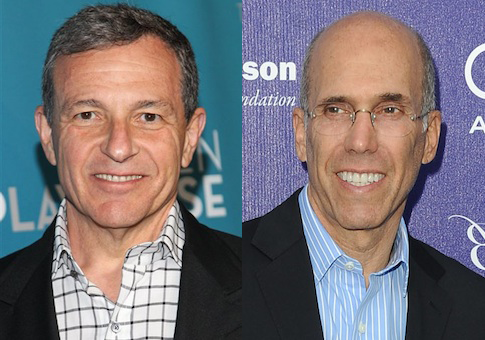 A new class action lawsuit targets companies including Jeffrey Katzenberg’s DreamWorks and Bob Iger’s Disney for agreeing not to pursue employees of competitors. The antitrust lawsuit, filed in federal district court in San Jose on Monday, includes claims that while he was chief executive at Pixar, now a part of Disney, Steve Jobs formed a "no raid" pact with DreamWorks Chief Executive Jeffrey Katzenberg in which they vowed not to actively pursue each other’s employees. That deal and others cited in the complaint are alleged to have affected the wages of thousands of employees by limiting competition. The lawsuit was filed on behalf of Robert Nitsch, who was a senior character effects artist at DreamWorks Animation from 2007 to 2011. "Visual effects and animation companies have conspired to systematically suppress the wages and salaries of those who they claim to prize as their greatest assets—their own workers," the complaint alleges. "The conspiracy deprived Plaintiff and other class members of millions of dollars which Defendants instead put to their bottom lines." Katzenberg has donated millions to Democratic candidates and groups and been one of President Obama’s closest allies, which even earned him the prestigious 2013 National Medal of Arts. Iger is also a generous Democratic donor, giving more than $200,000 to Democrats since 2009 from his $34.3 million annual compensation. This entry was posted in Politics and tagged Democratic Donors, Jeffrey Katzenberg. Bookmark the permalink.